Every Friday I’ll indulge my order-crazed brain in a list of randomness. Welcome to my Friday Fives. Tonight Joe is performing Brahms’ German Requiem with the American Festival Chorus. The word “Requiem” might seem a little intimidating to most. It’s literally a ‘Mass for the Dead.’ What’s not heavy or intimidating about that? But, musicians know Requiems are the stuff of dreams and some of the most beautiful, most powerful music ever written. Need proof? Check out Mozart’s, Faure’s or, my favorite and maybe the most famous, Verdi’s…and don’t forget to pick your jaw up off the floor when you’re finished listening. Ohmygod, the 22-minute mark of the Verdi. I get chills every single time I hear it. I’ve never played Brahms’ Requiem, despite him being one of my top three favorite composers. I joke with Joe that I’m a Brahms-hornist. His is the music I like to play most and, to me, what I play best. His harmonies, his heart, the forward motion of his works…its some of the most thoughtful music you might ever experience. If I had to list my top five works by Brahms it wouldn’t be too surprising. The man only wrote four symphonies and one horn trio. Done. So, I decided to be a little more specific and draw out some of my favorite moments for you to enjoy. This is just the beginning of Brahms’ beauty. If you aren’t familiar with it, grab a cup of tea. You’re about to hear the best of it. Listening to this makes me wish he had written a horn concerto. I love his play between soloist and orchestra. One of the things I love most about Brahms’ symphonic works is his powerful brass chorale-like writing. It’s distinct, but doesn’t detract from the rest of the orchestra. This movement is a perfect example of it. I also love it because it’s the first of his symphonies I performed as principal. It’s when I knew Marci + Johannes = Forever. Another great symphonic finale. This one, however, holds an even more special place in my heart. Joe and I performed this while on a European Tour with our Chinese orchestra. The concert was in Paris where Napoleon was buried and this movement features a powerful “alp horn” section where the 1st and 2nd horns echo back and forth….as loud as possible. Quote possibly one of our finest moments as a performing couple. Oh, did we wake you, Napoleon? Listen for the glorious, understated low-brass chorale at 3:46. The horns come in right after at 4:10. The first time I ever played this was at a summer festival where the conductor was getting a lesson. Poor guy wasn’t capturing the heart of the movement, so his instructor came to the podium to work on the second theme. It’s a gorgeous melody that feels equally heart-warming and heart-wrenching. He called it the “Grandmother Theme.” And now I can’t hear it without thinking of my own grandmas. It’s beautiful like that. Picture your own when the theme starts at 2:35. Of course this would be my number one. I wish I could put the whole piece as my favorite, but if I had to pick a movement, this would be it. The piece was written shortly after the death of Brahms’ mother and, in this movement especially, you feel his intense grief as if it’s your own. It’s quite remarkable and brings me to tears in live performances. I cannot tell you how much time I’ve spent listening to all of these videos as I’ve found them. I thought this was going to be a fast post to throw together, but that’s what happens with Brahms. It’s hard to come back to reality when you’ve heard a piece of heaven. It was a baking bonanza around here this week! Our dear friend Chris celebrated his birthday on Monday and in wishing him many happy returns I told him he could pick a birthday treat of choice. I even listed off some popular options….like cake…cupcakes…brownies. And just for fun (vegetarian fun, I guess) I threw in bacon too. 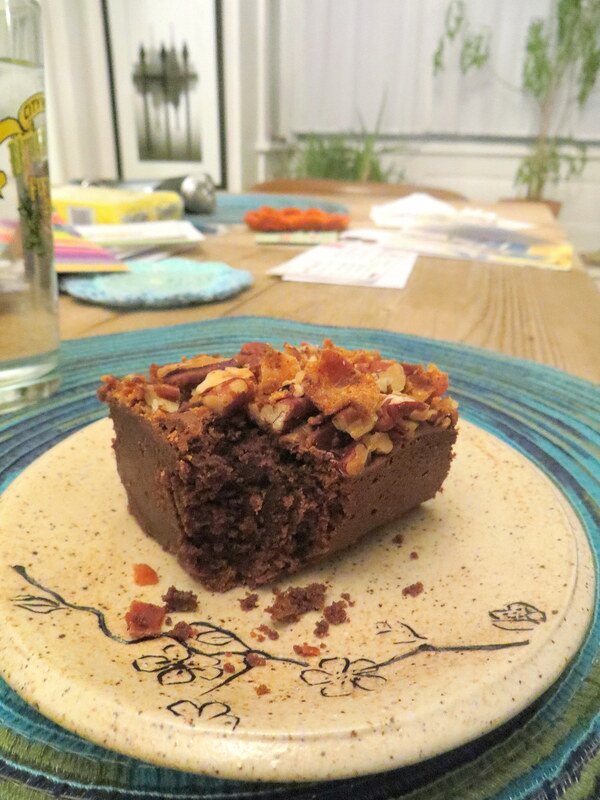 So he wrote back “Bacon Brownies?” …..game on. Between Pinterest, my cookbook collection and my stash of clippings, I feel like I have a recipe for just about anything. Except Bacon Brownies. But, luckily, a highly-rated recipe is always just a click away. And the next thing you know, our kitchen reeks of bacon and Bella’s camped out next to the air purifier waiting for her portion to fall. I love baking for friends…well, anyone, really…but part of that fun is me getting to taste it. I mean, that’s why we bake right? To eat it. This was the first recipe I’ve made that I haven’t been able to even try. Not even a lick of the beater or a finger-swipe around the bowl. Cue the sad music and hand me a violin, will ya? 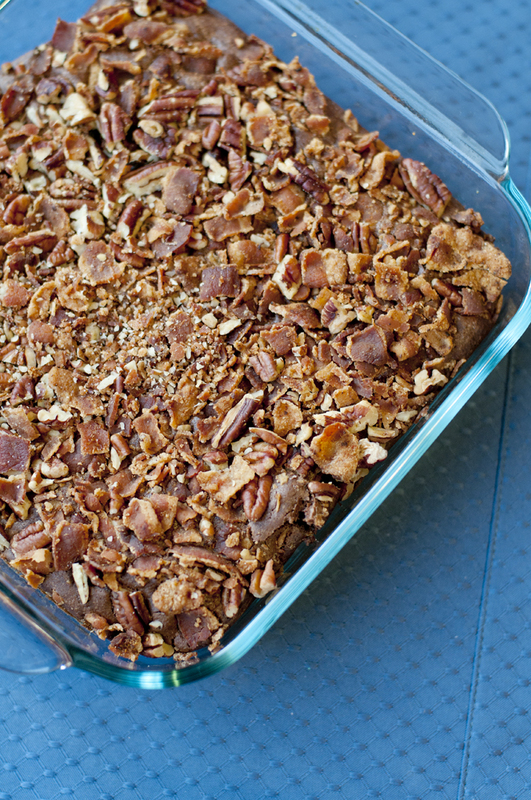 Don’t let that confetti of fried bacon bits and toasted pecans fool you. You know what’s lurking under that crunchy layer, wrapped up in that chocolate batter? Bourbon. Okay, well, that’s never stopped me…you know what else is in there??? I forgot to mention in my latest baking post that cookies require NO recipe adjusting for the high-altitude. Amen! But, you might remember that brownies do. I added probably 1/8 c. of extra flour to this batter. The recipe says it should be “jiggly” and to not over bake. I under baked these by 5 minutes and everything had already set, but Joe assures me they weren’t dry or over baked. So my advice is to keep a watchful eye on it. My very best taste-tester assured me they were fudgy, dense, incredibly rich and delicious. He said it tasted like a brownie you’d pay $10 for at a restaurant. 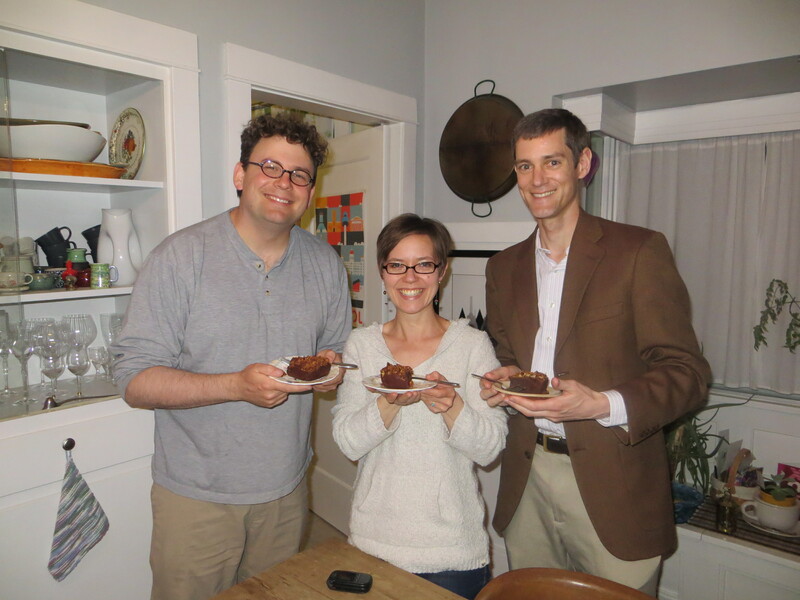 Here are the meat-eaters enjoying their Bacon Brownies. Happy birthday, Chris! We love you and Chilali and are so thankful for your friendship and all the fun we always have together. You make Utah extra awesome. Preheat the oven to 350°. Line a 9-inch square baking pan with parchment paper, allowing 2 inches of overhang on 2 opposite sides. Spray the paper with vegetable spray. Spread the pecans in a pie plate and toast for about 8 minutes, until fragrant. Let cool, then coarsely chop the nuts. In a skillet, cook the bacon over moderate heat, turning once, until crisp. Drain on paper towels and let cool; reserve 3 tablespoons of the fat. Finely chop the bacon. In a saucepan, combine both chocolates with the butter and stir over very low heat, until melted; scrape into a large bowl. Using a handheld electric mixer, beat in both sugars with the reserved 3 tablespoons of bacon fat. Beat in the bourbon. Add the eggs and salt and beat until smooth. Sift the cocoa and flour into the bowl and beat until blended. 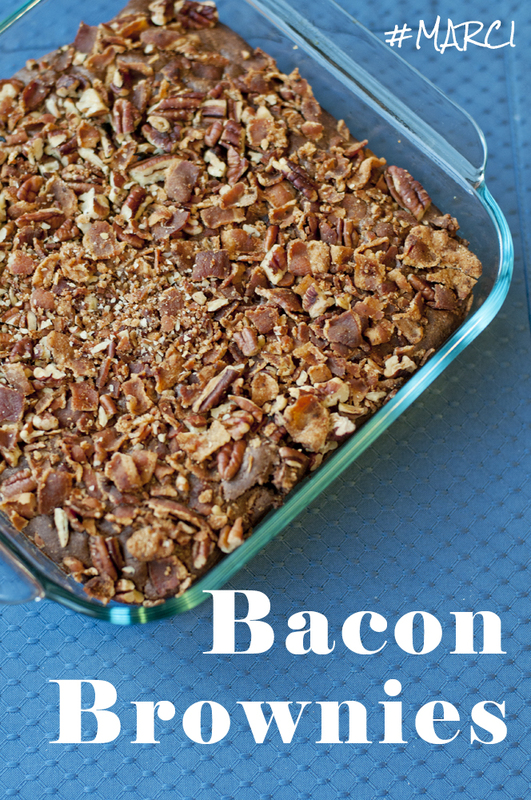 Scrape the batter into the prepared pan and sprinkle the bacon and pecans on top. Bake for about 50 minutes, until the brownies are set around the edges but slightly wobbly in the center; a toothpick inserted into the center should have some batter clinging to it. Transfer the pan to a rack and let the brownies cool completely. Another, less-healthy part of our Sunday-Funday was a little baking. One of my staff workers was having a birthday over the weekend, so I wanted to bring in a treat for everyone to enjoy on Monday. And, let’s face it, every day I’m baking is a Funday. Especially when it involves a new recipe for stuffed cookies. Hang on to your britches, it’s about to get real up in here. Last year for Christmas one of my co-workers baked up a batch of Oreo-Stuffed Chocolate Chip cookies and they were such a hit. The memory of such an incredible-tasting bite been tucked in the recesses of my recipe-obsessed brain ever since, just waiting for the perfect time to come out and this was it. I know I rave about most of the recipes I post here. I can’t help it. I’m a true food enthusiast, but believe me when I say these were some of the best cookies I’ve ever made. In fact, I told Joe I’m going to stick with this recipe for my regular Chocolate Chip cookies from now on. That’s how good they were — a perfect chewy consistency. No thin, crispy cookies in my house! Look at how big they are. I swear, these cookies have me swooning. This recipe comes from Jenny over at The Picky Palate and you should definitely check out her photos of the stuffing process…oh and thank her for such a fabulous recipe while you’re there. I loved watching my colleagues try the cookies. Their faces gave it all away, saying “Wow! that’s one big cookie. Okay, I’ll try it…OHMYGOD THERE’S AN OREO IN THERE!! Whaat? ?” It’s like the best surprise party ever for your mouth. …. 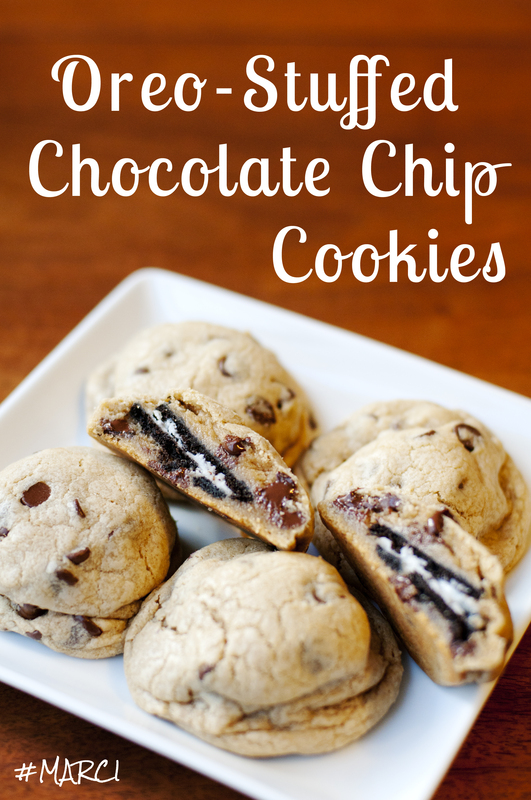 These really are the perfect cookie-gift, especially as we near the warm months of summer. I can see myself packing up a few to take to the pool, or as a stellar addition to any picnic, or a midnight snack while binge watching TV. 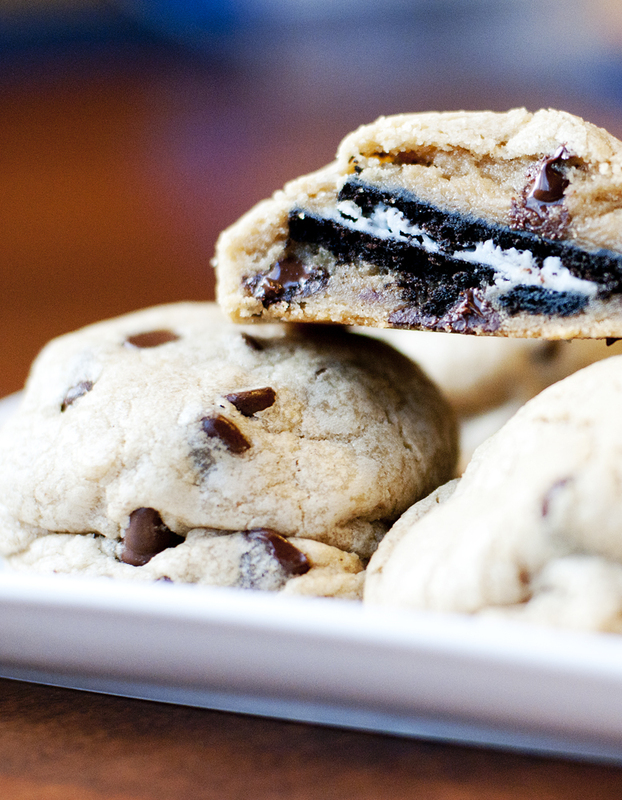 I know you didn’t think Oreos could get any better, but BAM! 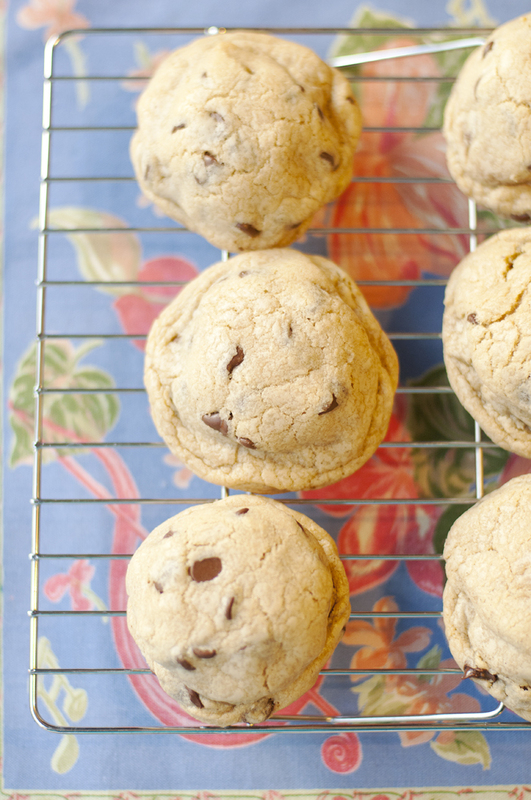 they just did thanks to the warm, gooey embrace of some cookie dough. What ISN’T better by a cookie dough hug? What ELSE can I wrap in cookie dough?? Seriously. Try these. You’ll never go back. Preheat oven to 350 degrees. In a stand or using an electric mixer, cream butter and sugars until well combined. Add in eggs and vanilla until well combined. In a separate bowl mix the flour, salt and baking soda. Slowly add to wet ingredients along with chocolate chips until just combined. Using a cookie scoop take one scoop of cookie dough and place on top of an Oreo cookie. Take another scoop of dough and place on bottom of Oreo Cookie. 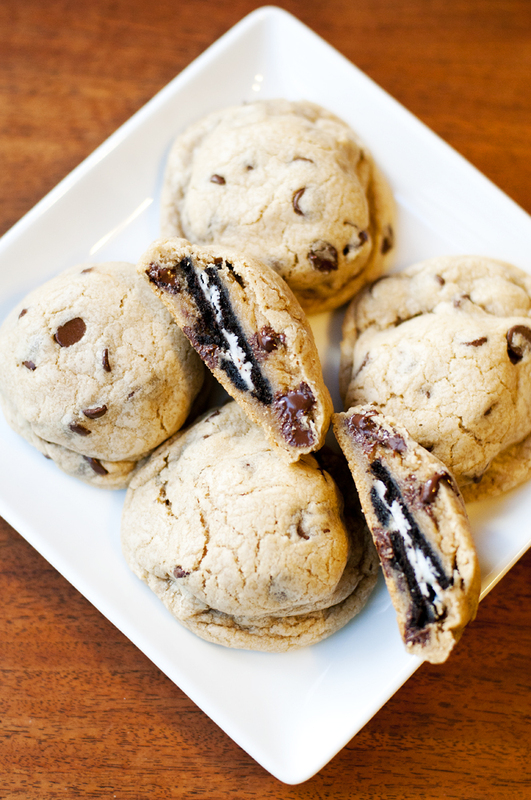 Seal edges together by pressing and cupping in hand until Oreo Cookie is enclosed with dough. Place onto a parchment-lined baking sheet and bake cookies 9-13 minutes or until cookies are baked to your liking. 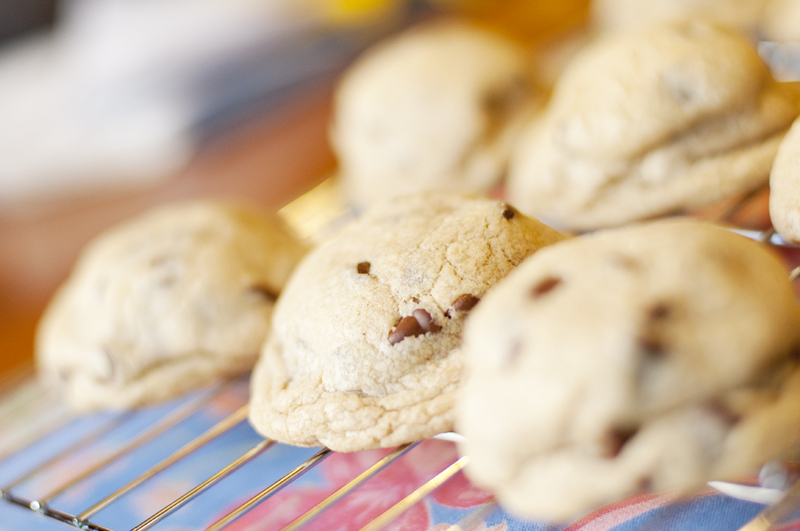 Cookies should still be a little gooey – DON’T OVERBAKE!! Let cool for 5 minutes before transferring to cooling rack. With busy work weeks and Saturdays now spent running errands and playing catch-up, Joe and I have declared our day of rest to be “Sunday Fun-Days.” We need a day together for general merriment and as little stress as possible. We tried it out last Sunday and had THE most perfect day I’ve had in a long time. I could get used to this new rule. 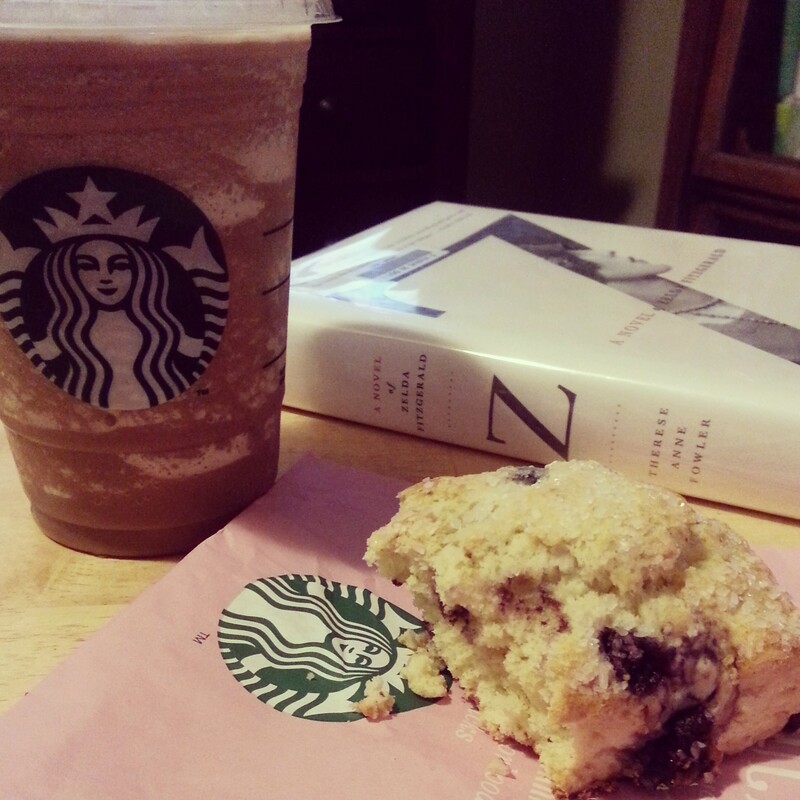 Those on Instagram already saw, but we stared out the day by sleeping in and then throwing on baseball hats to grab Starbucks, which I enjoyed with a good great fantastic book. To celebrate the brave survival of our first Utah Winter, we went for a hike. <— A sentence I never dreamed I’d ever type. Who am I? We didn’t have to go outside the canyon like we did with Sean and Wallis over the summer. 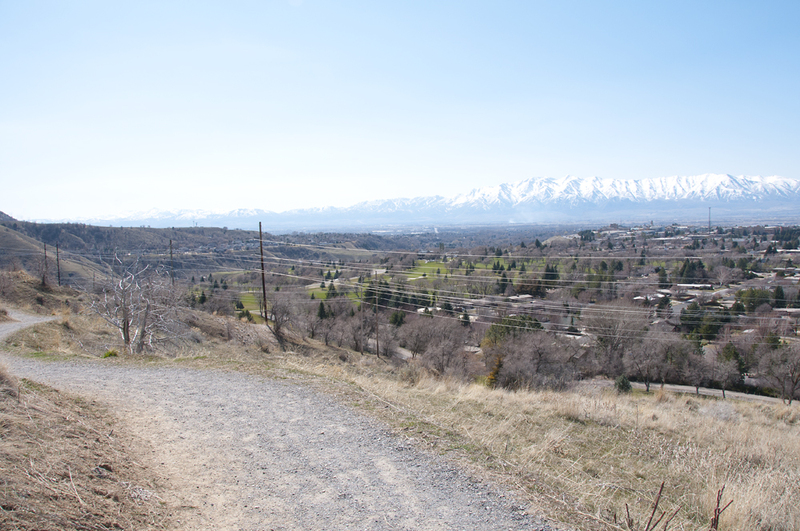 This trail is right in Logan, just on the slopes of the Wasatch mountain range looking down on the city. 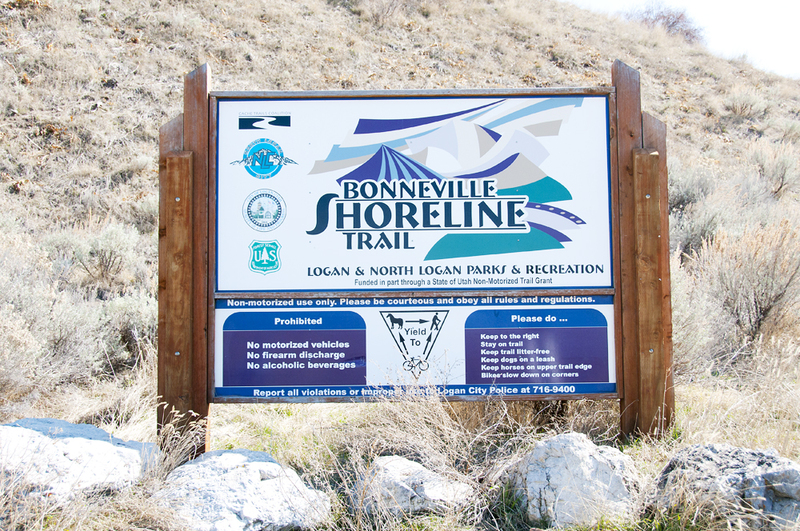 Welcome to the Bonneville Shoreline Trail! 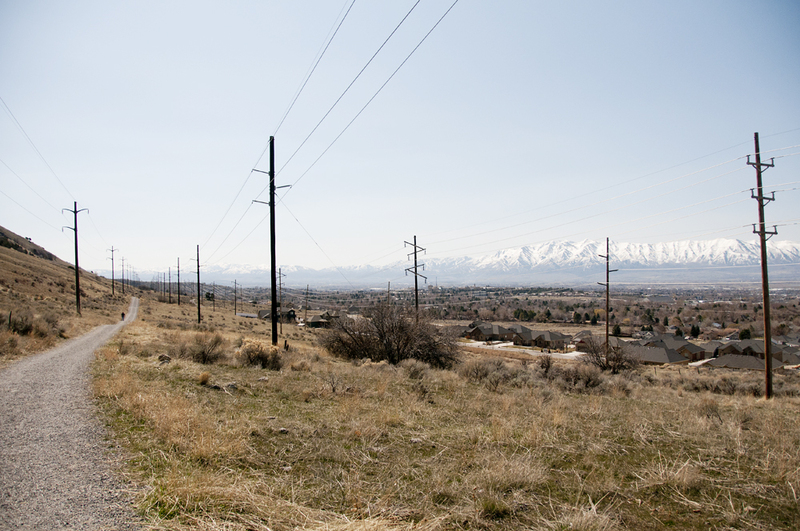 The trail follows the eastern shoreline of ancient Lake Bonneville. Lake Bonneville filled the Great Basin which covers much of the western United States. The lake existed in the late pleisteine period when Utah was a much wetter place and glaciers sat nestled in the peaks of the Wasatch Range. 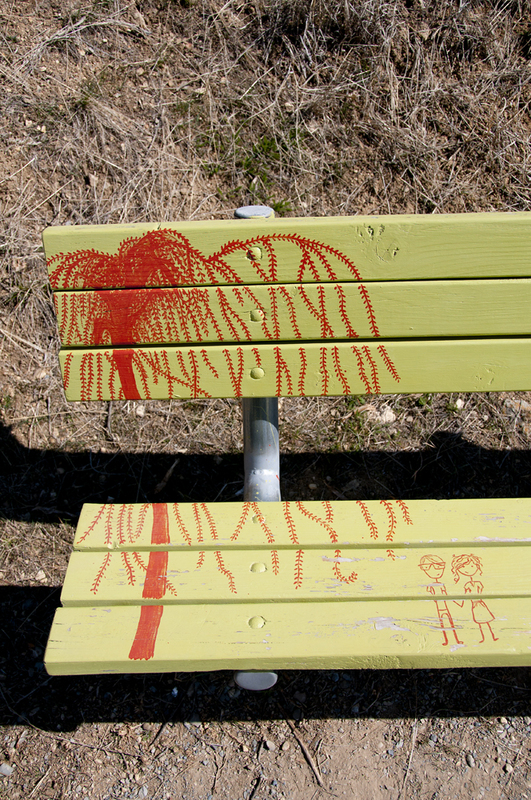 The Lake created a series of benches as it slowly receded into the desert over thousands of years. 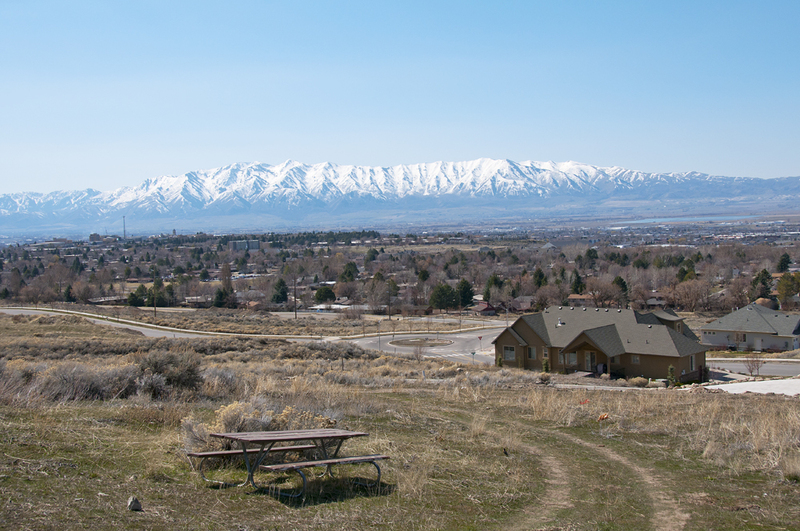 Many of Utah’s cities are built on the lower benches and the Bonneville Shoreline trail follows the upper benches. A route around a lake shore may sound like a gentle path, but the Bonneville shoreline is not. In the thousands of years since the lake evaporated and left its child the Great Salt Lake in the valley the rivers and streams running from the mountains have cut canyons and ravines across the once even shore. The trail continuously descends into and climbs out of these obstacles along its route. 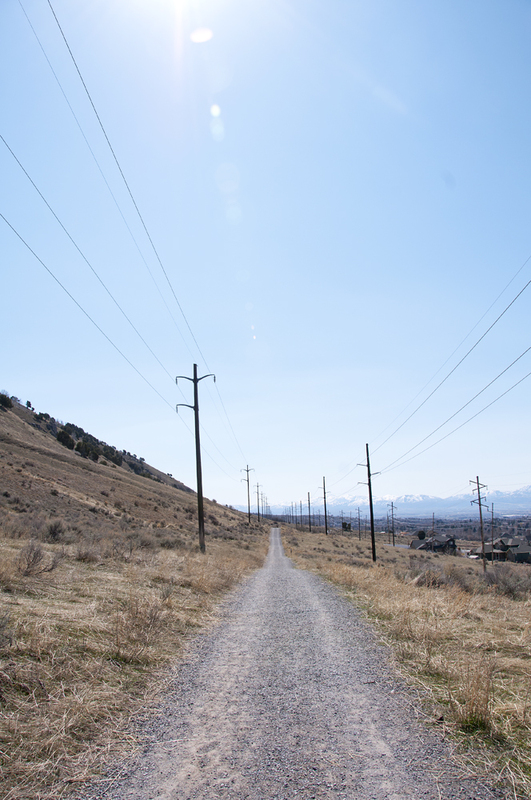 The Bonneville Shoreline Trail runs on top of the Wasatch fault for most of its route. 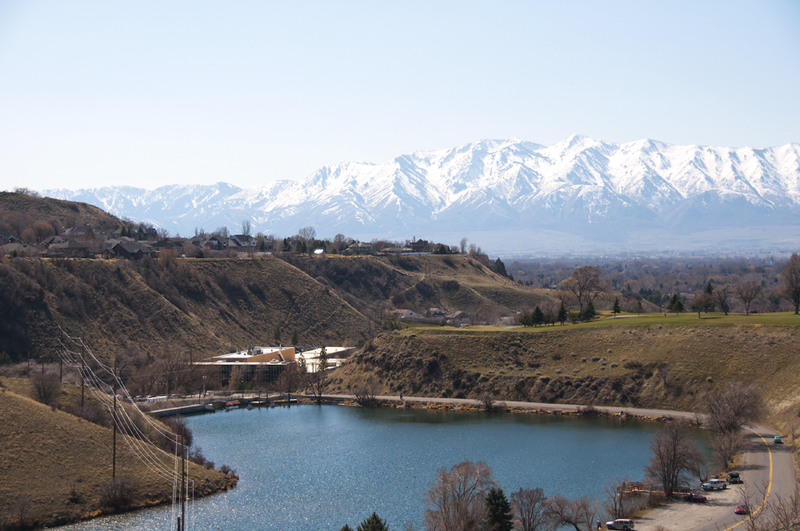 The Wasatch fault is still active, pushing the peaks of the Wasatch Range higher. We took a 3+-mile, telephone-pole-laden portion of its path slowly, soaking up the sun and the fact that we haven’t been outside much since November. It was the perfect way to unplug from phones, internet, March Madness, work…and plug into US. We stopped to admire new grass, to check out weird trees, watch spiders and to talk. Lots of talking. Topics included: Trips we want to take – How to celebrate our upcoming anniversary – How much would it cost to clone Bella – House-hunting – House-building – Summer plans – New hobbies for Joe – New Etsy ideas for me – Ways to simplify our life…..and on and on and on. We’re a couple of dreamers, him and me. Dreamers and Doers. My favorite part was how quiet it was. We heard a few trucks shifting gears now and then, but otherwise it was perfectly calm and (more importantly) perfectly silent. It was even too early for the bugs to be humming. It was just us and the scraping of gravel beneath our boots, which is soothing to me in itself. Though most signs of winter are behind us, the trail did offer a lovely view of the still-snowy Wellsvilles. Most of our surroundings showed the aftermath of our harsh freezes. Lots of dry and dead everywhere you look. 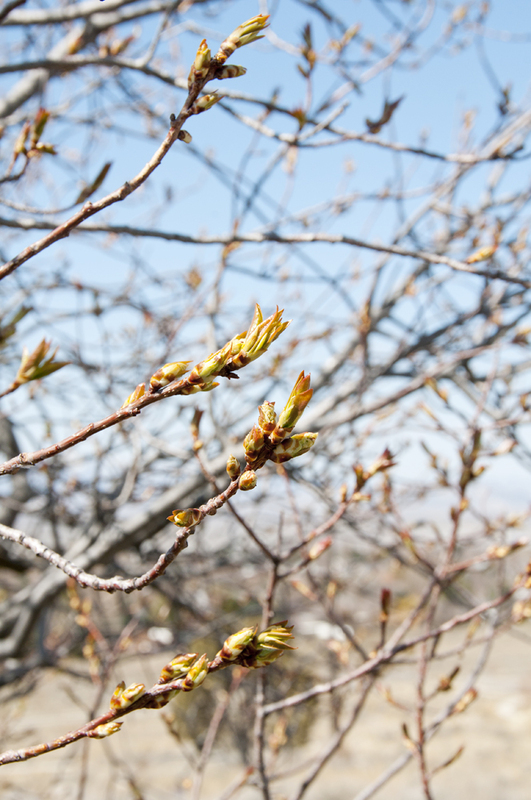 But there was also life in the form of little buds on trees and the occasional tuft of grass peeking through the rocks. Here’s one of those weird trees I mentioned. 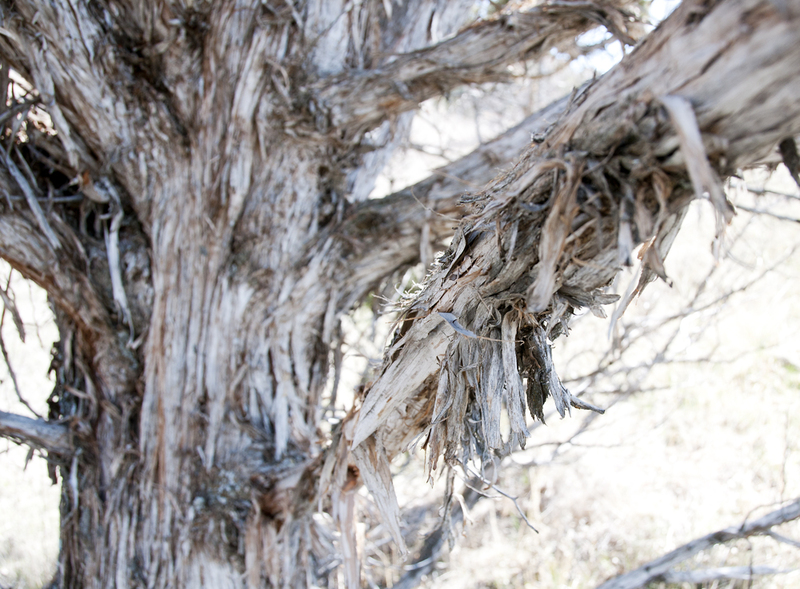 Its bark looked like streamers from a party held long ago. 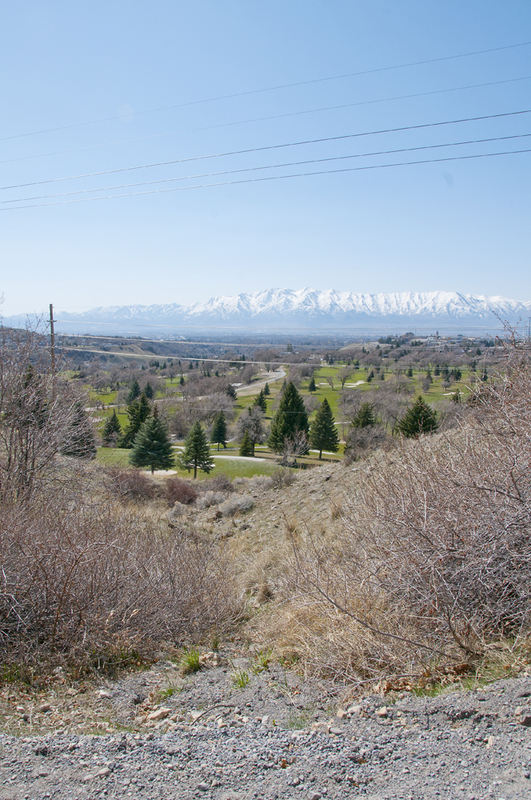 At one point the trail overlooked the Logan Country Club golf course so we had a hint of future greenery. Man, I’m ready for Spring. 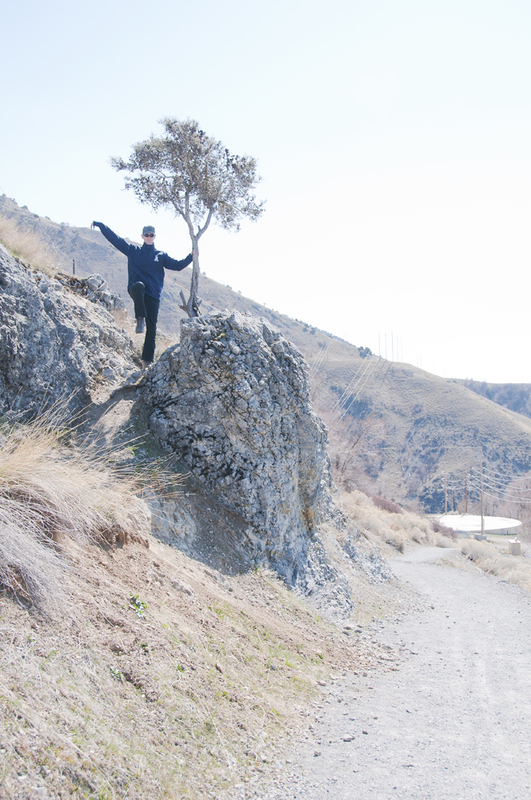 The trail ended near the edge of the canyon, a lovely scenic spot we enjoyed before turning back the way we came. Welcome back, animal friends. Oh, how we missed your songs these last four-five months. 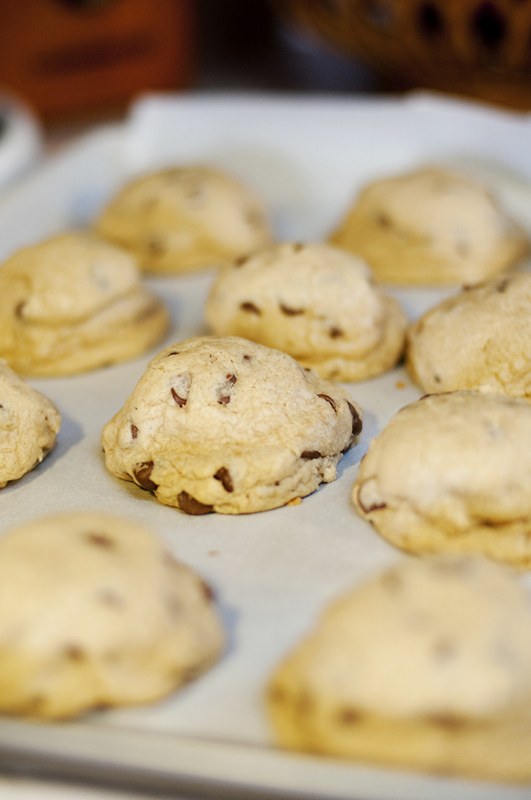 Our perfect day continued with baking maybe the best cookie ever…that post is coming soon. You won’t want to miss it. I’m found myself thinking of this walk and our perfect day together while I’m sitting at my desk. It gets me through tough afternoons when all I’d rather be doing is walking in the sunshine holding his hand. Until next week–here’s to Sunday-Fundays and to remembering why we work so hard every other day. Enjoy it! Here’s the best news of my week: Gramps is now back home! This is the doing of some amazing nurses and doctors, steady prayers and one very, very strong man. One of my cousin’s friends captured these wonderful videos of Gramps making music with his roommate’s family while in the nursing home facility. I told you he’s always surrounded by music. I love these and I love him. Thank you for all of your well-wishes! 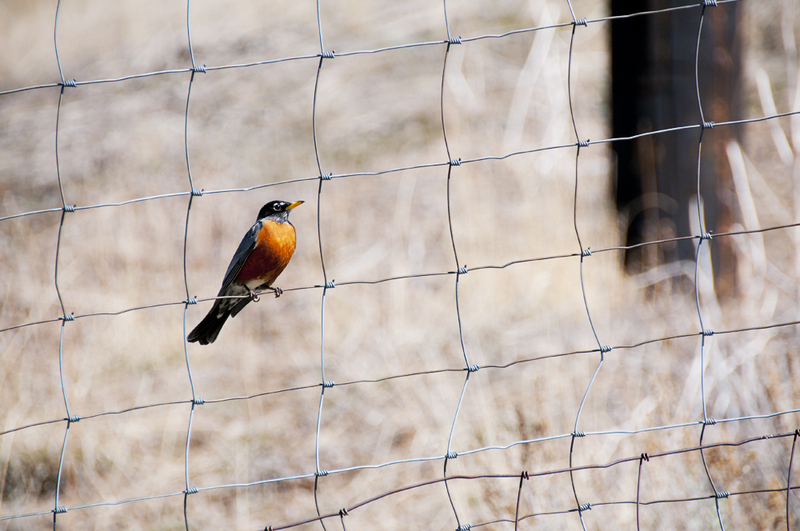 Did you know yesterday was the first day of Spring? For us in Utah, our first snowfall came just a week after the first day of Fall. What will this landmark date bring? My guess is more of the same: cold. 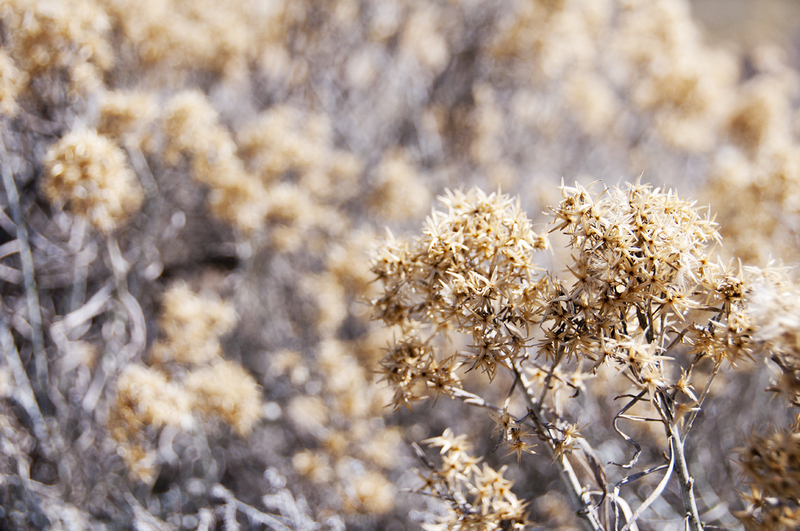 No matter what Mother Nature throws our way, I have visions of spring cleaning on my mind. Look out weekend; no speck of dust or pile of papers is safe. There has been a lot going on since I got back from Dallas and Joe got back from Colorado/Dallas/Vegas, so I thought you might enjoy another glimpse into our week…random style…for today’s Friday Five. Thanks for all the sweet messages about my grandfather. He’s been moved to a long-term facility to continue battling the infection. But, once it’s cleared, it’s H-O-M-E for him! Please continue sending prayers, well-wishes and love his way. You would think this holiday would be one for the books where us Irish are concerned. But in this O’Falvey/McGee household, the holiday seemed to pass us by quickly, with only a flash of green attire and a quick McDonalds run (post-gym, no less) for a Shamrock Shake. I feel like a McFailure, an O’Sham. We even had whiskey and Bailey’s sitting on our counter! I blame it falling on a Monday. I briefly wrote about my worsening headaches once I hit 30. I thought those were migraines. That intense ache that persisted for a long time…that’s not a migraine? No, it’s not. Last Saturday I had my very first I’m-going-to-die-while-watching-TV migraine. A searing pain came out of nowhere, made me feel like I was going to toss every cookie I’d ever consumed, and had me spewing final messages for family to a very scared Joe. I’m nothing if not dramatic. Luckily, it wore off overnight and I woke up with one killer “headache hangover” on Sunday. These things run in my family and I’m hoping to meet a new doctor soon to run some tests and see what I can do to never have one again. Unless their solution is to give up peanut butter or dogs. In that case, migraines do your worst. Joe and I love love love March Madness. We’ve done bracket challenges for as long as I can remember, and this year’s Billion Dollar Bracket game just upped the ante ten-fold. I thought I had submitted a pretty strong, viable bracket, until that first game where Ohio State sent my billion-dollar dreams packing. But, as Joe says, there’s not a better way to lose that amount of money than seeing the Buckeyes lose. I have to give a special birthday shout-out to Violet, or Baby V as I’ve always called her. This tiny wonder came into the world early as a fierce fighter and continues to charm the pants off anyone she meets. She was the first baby I had really been around—not just the weekend visits with my nieces and nephews—but the diaper changes, the screams, the naps. I loved soaking up every minute with her, watching her amazing growth. Kim and Grant are incredible parents and when I asked Kim for permission to post a little video I put together for today, she said “Of course. Everyone should see how cute she is.” I couldn’t agree more. Happy birthday, Baby V! I’ve been a bachelorette this past week. Up until late last night, my poor deprived husband was in Vegas with his pep band for the basketball tournament. Don’t you just feel so sorry for him? Pure torture, I tell you. My life sans-hubs looked a lot like this: dog, work, dog, cook, dog, read, dog, sleep. Repeat. I especially missed his extra set of hands when it came to Bella, specifically when I drove home at lunch to walk her and then when walking her again late at night when it’s freezing and she’s smelling every blade of grass. 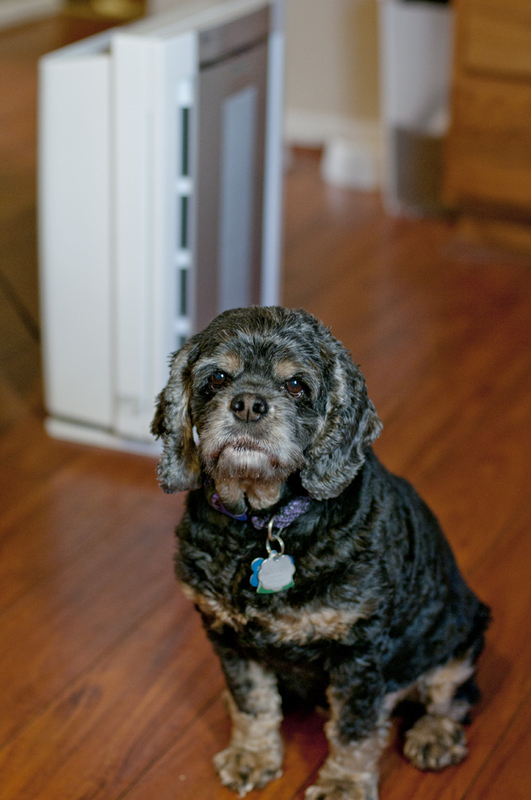 I’m usually the morning walker, which I know Joe misses most when I’m gone. We each have our better times of day for these things. Now, I consider myself a pretty strong female—Girl Power!—and there are some things that I do really well when I’m flying solo. And then there are things I just can’t do. One, big, important example is the thermostat. When you rent a property you very rarely have the user manuals for such things and we’ve lived a lot of places with a lot of different thermostats. I seriously cannot figure out the one we have now, which was apparent when I woke up the first night to Bella panting and me drenched in sweat…after I thought I had turned it down to 65 degrees. Nope, it was 72. And I was under flannel covers. This war between me and technology lasted all five days he was gone. It had me wishing Joe would teach me a catchy way to remember how it works, like Phil did for Claire. There is one opportunity I jump on every time Joe’s away and it involves the kitchen—the place where Joe and I can differ most. We’ve not-so-scientifically concluded that Joe is a “Super Taster” and therefore cannot tolerate the bold, salty flavors I crave. (Blue-dye tongue test still pending.) Though we eat the same things, we season our dishes separately so I can be as heavy-handed as I want in shakin’ out those spices. It’s a win-win for us, but there are plenty of foods I just can’t make because he won’t have anything to do with them. 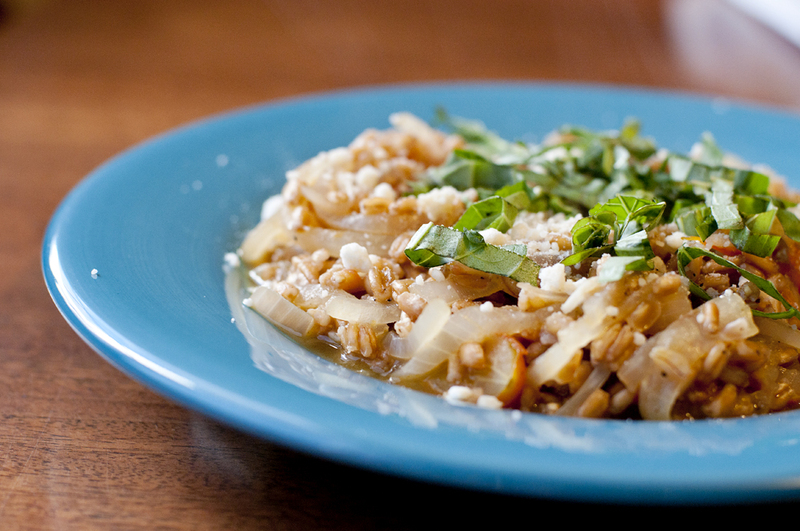 First up on my menu, a wonderful one-pan farro dish that I adore. Joe’s issue with it? Texture. I think it’s because the farro is a little chewy, so to some *cough-him* it might not taste fully cooked, but it’s just that great toothsome bite. This recipe calls for two cloves of garlic. I threw in three. I’m living life on the edge for my all-girls week. It also cooks up fast (30 minutes) with minimal dirty dishes. Love it. When you throw the ingredients in the pot, it will seriously just look like a pile of onions on top of water. But as it cooks, those onions and tomatoes start to break down and transform the water into a savory broth that tastes as though it’s been cooking for hours. It becomes infused with tangy, sweet, salty goodness. It even works really well as a side dish for all you meat lovers. I used some of the leftovers to compliment a Trader Joe’s curry-spiced veggie patty. The tomatoes and onions were a perfect match for its Indian spices. I’ll get to the recipes in a minute, but first I have to tell you about the crazy new recipe I tried. If there’s one thing that I love and Joe hates, it’s garlic….okay, garlic yes, but it’s also pickles. I like to test his gag reflex by drinking the juice in front of him. Mmmmm. 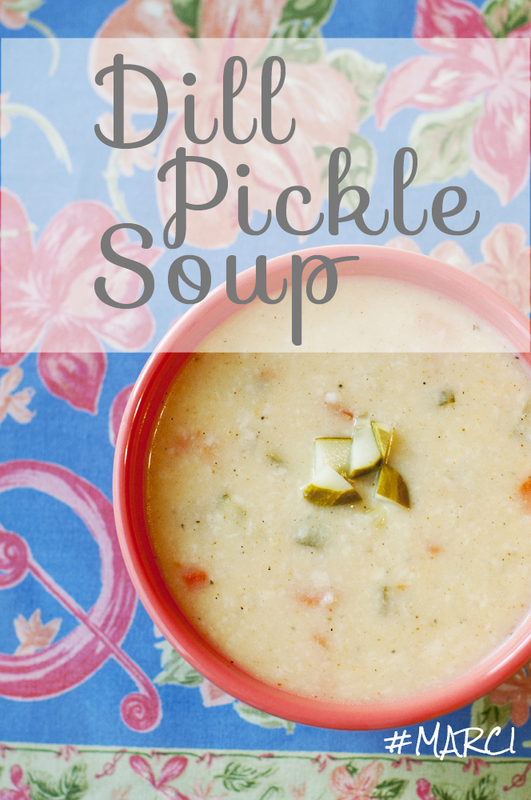 I had pinned a recipe a while back for Dill Pickle Soup. It reminded me of the time a bunch of us went to Detroit’s Polish Village Café after seeing their Dill Pickle Soup featured on Diners, Drive-Ins and Dives. I remember loving their version and wanting to try my own. This was my chance. And I even broke out the girly placemats to celebrate. The soup has a potato base and instead of pureeing it at the end, the potatoes break apart into bits while you whisk and the carrots soften but remain whole, so it’s a very hearty soup. The best part was its thickening agent—you mix flour and water with SOUR CREAM to make a paste. Wow, it felt strange to do it that way, but it thickened up so quick and had the most velvety rich texture. 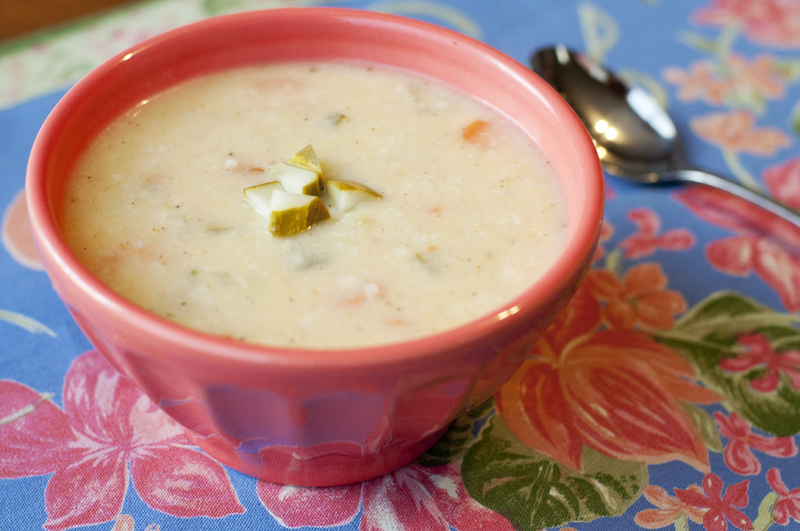 Decadent – well, as decadent as pickle soup can be. If you’re a fan of pickles, I’d highly recommend trying this odd, yet satisfying meal. 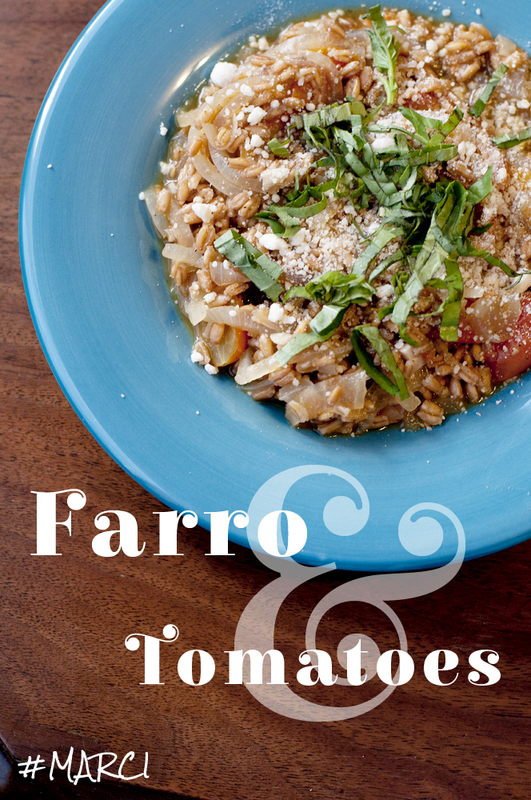 Here are the recipes for both the soup and the farro. Enjoy! Oh, and thanks to Daylight Savings, I now have sunlight AFTER I cook dinner. It’s a photographic miracle! Place water and farro in a medium saucepan to pre-soak while you prepare the other ingredients. Adding each ingredient to the pot as you finish preparing it, cut onion in half again, and very thinly slice it into quarter-moons. Thinly slice garlic cloves as well. Halve or quarter tomatoes. Add salt, pepper flakes (to taste) and 1 tablespoon olive oil to pan, and set a timer for 30 minutes. Bring uncovered pan up to a boil, then reduce to a gentle simmer, stirring occasionally. When the timer rings, the farro should be perfectly cooked (tender but with a meaty chew), seasoned and the cooking water should be almost completely absorbed. If needed, though I’ve never found it necessary, cook it for 5 additional minutes, until farro is more tender. Transfer to a wide serving bowl. If there’s enough leftover cooking liquid to be bothersome, simply use a slotted spoon to leave the amount you wish to behind. 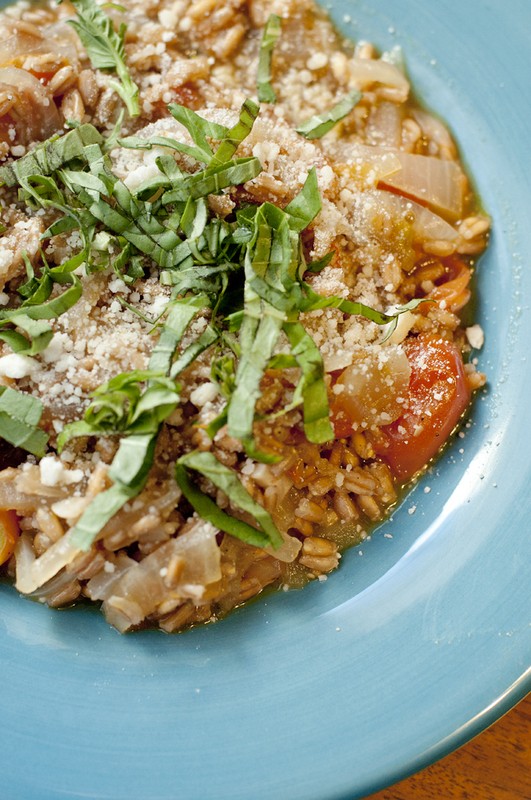 Drizzle farro lightly with additional olive oil, scatter with basil and parmesan. In a large pot, combine broth, potatoes, carrots and butter. Bring to a boil and cook until the potatoes are tender. Add pickles and continue to simmer. Add pickle juice, Old Bay, salt (*see below), pepper and cayenne. Cook 5 more minutes and remove from heat. Serve immediately. *All pickle juice is not created equal. Some is saltier than others. 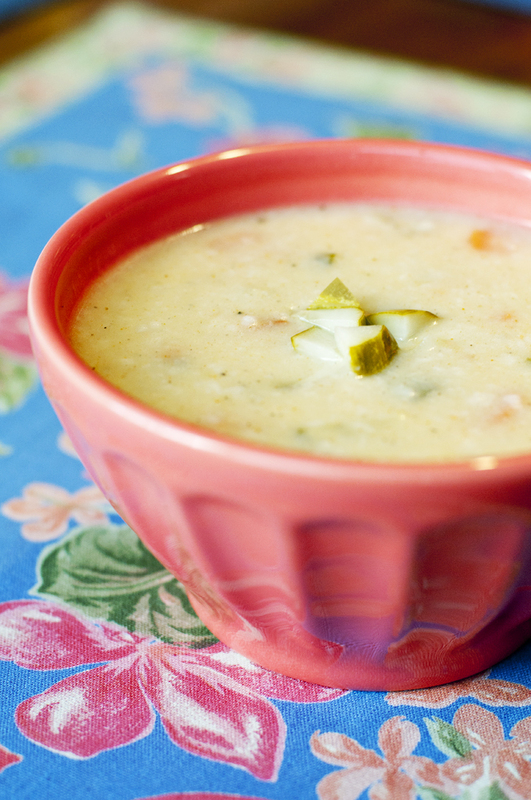 Taste your soup after adding the pickle juice and final seasonings. It’s possible you will not need any salt or would prefer more or less.